We believe that the dignity, diversity and contribution of each person is to be valued. We believe that all individuals and our environment are to be valued and worthy of respect. We believe in building and nourishing each other’s personal faith relationship with Christ. 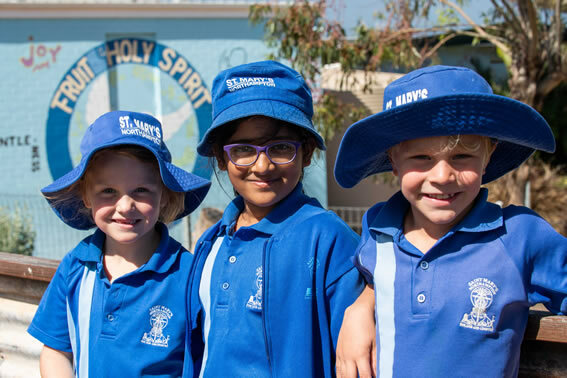 We believe in providing a challenging, purposeful and stimulating curriculum through quality teaching and learning that is tailored to meet the needs of individual students. We believe a culture for learning is nurtured and sustained by cooperation and collaboration among students, parents, staff and other invested groups. We believe honest and open communication provides effective feedback for students, teachers and parents. O God, guide us to make good choices at all times. Bless this School, Church and Community and bless everything we do. With the help of Jesus and our teachers, we grow in faith here at St Mary’s.